Palo Alto Software will be exhibiting at the Business Startup Show in London on Nov 2 and 3rd. Our Managing Director of our UK operation, Alan Gleeson, will be speaking on Friday on Business Planning. If you are in the area, come stop by and say hi! We are happy to answer any business, marketing or strategic planning questions you may have! Bplans Blog a Top Ten Blog! Bplans is mentioned as one of the Top 100 Business Blogs at the Branding and Marketing Blog. Hurray! **Late Addition** Chris over at Branding and Marketing aptly pointed out that the real complier of the list was John Crickett on his Business and Opportunities Blog. Sorry John! Today on Marketing Prof's Daily Fix, Paul Barsch writes "Glorifying the Gut." He references the trends that we have seen recently that push business people to use intuition and gut feel, instead of real facts and data to make decision. Thank goodness though, that Paul seems to think that the pendulum may be swinging back to people doing their homework and using analysis to make decisions. There is always room for gut feeling as an entrepreneur, or someone running a small business. BUT that does NOT mean that one should ignore tools to help gather the appropriate information to make decisions. This is why planning is key. If you plan as you go, creating a plan for your business, your product launch, or your marketing campaign, you will be forced to lay out a structure that includes data and some research. Then you will have set goals and objectives that you can measure, to see whether they were successful. Now you are making decisions based on information -- and a little gut, instead of the other way around. Guy Kawasaki and Glenn Kelman have combined for a pair of very important posts related to reality in planning and financial projections. In the first, Glenn shares the plan vs. actual results of his successful startup Redfin. In the second, he shares the Microsoft Excel model he and others used to build that initial plan. The first of these two is Two Years of the Real Numbers of a Startup. It's an excellent reminder of how planning works with reality. Your numbers aren't going to be right, nobody's numbers are, and this post opens the numbers up and tells a simple story of how some were way off, some close, some too high, and some too low. Importantly, the startup is successful, and the planning helped. Focus on headcount. Outside of marketing programs, the basis for all cost in Internet software is headcount. Just figure out whom you'll hire and how much you'll pay and you can't go far wrong. Plan slow, run fast. The most likely scenario is that you won't be able to hire engineers fast enough, and that revenues will come more slowly too. Investors expect their money to drive artificially accelerated growth rates, but signing up for that sometimes just blows a company up before you've had a chance to figure everything out. At least in the financial model, give yourself as much time to grow as you can. Glenn's point isn't to make a statement one way or the other about Redfin's business or to even give you a crystal ball for seeing whether you'll succeed. A model, after all, doesn't drive demand or serve customers; it only helps you count up the beans if you do. We're posting this model because its basic structure might help other entrepreneurs who don't know where to start. I say Guy and Glenn have done the world more good than they realize. It really helps make an important point: Excel financial modeling, undocumented and unproductized, is extremely hard to share. Spreadsheets are an amazing programming application language, incredibly useful, but mainly as a user's tool. The more detailed the model, the harder for anybody but the author to use. Too many otherwise business-literate people think financial models are a combination of black magic and paint by numbers. Too many people who can do financial modeling in Excel think that their way to do it is the only correct way to do it. Too bad. Disclosure: I am biased, I am the principal author of Business Plan Pro®. The difference between Glenn's model and Business Plan Pro is that Business Plan Pro has a standard, correct financial model that is also productized, locked up in an application to prevent accidental errors, and documented. Unlike all those Excel authors who think theirs is the only way to do it, this one doesn't claim to be "more" correct; but it is, in fact, correct, error checked, productized, and documented. So it's not the only way, but it's a valid way, and it comes inside a full product. And I want to make it clear that I am not criticizing Glenn or Guy here, because neither of them in any way implies that they think their model is "right" for others. It comes up because through the years of dealing with Business Plan Pro, which has been sold to more than a million users, we still get people insisting that their detailed, specific-to-their-case model is "more right." And we have people who should be in a position to know, like accountants and consultants, telling their poor unsuspecting clients that there is something "not right" about anybody's model but their own. That condemns their victims to not using a correct and productized model. Is it worth saving $99 by using somebody else's raw Excel? How many extra hours of work, not to mention frustration and annoyance, will that cost you. Divide the $99 that Business Plan Pro costs by the number of extra hours, and you'll get your equivalent hourly rate. Was it worth it? One evening when I was attending college in the mid-west I was out photographing distant barns, silos, trees, gently waving rows of corn stalks, etc. on the skyline silhouetted by the great red orb of the sun slowly dropping below the horizon. It was a glorious sight, and I think I got some nice shots. To this day I love watching sunsets. While this was happening some friends came out of their apartment and were urgently calling me. I turned around and they were looking my way, but had their eyes covered by their hands. They told me don't look at the sun! You'll hurt your eyes! Look away! Look away! Now, even at that time of my life I had watched hundreds, if not thousands, of sunsets. It turns out these friends had been born and raised in Chicago. They had lived their entire lives, to that point, within a world bounded by multiple stories of brick and concrete. For these folks the sun set at 2:30pm behind the apartment building on the next block, so of course, you could hurt your eyes if you looked at the mid-day sun. These folks had never seen the sun set on the horizon. How very sad I thought. Today I am again thinking how sad it is that so many people never see the sunset on the horizon. They never see the panoply of colors in the sky, nor the great globe of the sun settling majestically, nor do they wait expectantly for the green flash as the last nail paring-thin limb drops from sight. No, they are busy, busy, busy, working 60-70+ hour weeks, month after month, isolated from the rest of their world, living to work, instead of working so that they might live and have a life. So, what about you? What is your choice? I tend to think viral marketing must happen online -- but Seth Godin's post points out some classic "offline" examples. Interesting stuff! For all you marketers - especially all of you in the online marketing world, read his post today. He does a great job defining the clear difference between "word of mouth" and viral marketing. I just posted on Mommy CEO about a great business, ZAPPOS.COM. I think the biggest takeaway from this business is that they have obviously understood that an excellent customer experience will be the competitive differentiator that will make them successful. I think, based on what I know about ZAPPOS, that they have accomplished this by hiring customer service people and letting them use their brains. Too often, when I call a company about an issue, I hear "the policy is.. or I am sorry but I am not allowed to...or the rules surrounding this procedure are..." Ultimately what they are telling me is that they are not empowered to help me, and that I am just plain out of luck. Too bad. Now, what if you always dealt with people who were able to look at your problem, and you as a customer, on an individual level. Not that they would not have guidelines, and general policy, but that they were allowed to use their brain and help you fix a problem. I remember calling United Airlines once, when I had bought a ticket for my 14 month old son, after I had already booked my ticket and my husband's ticket. We had decided we wanted him to have a seat. United could NOT add my son to our itinerary. He had his own itinerary. OK. Fine. Well, as often happens, one of the legs of the flight was canceled and we were re-booked. My husband and I were re-booked through San Francisco, and yes, my 14 month old son was booked through Denver. By HIMSELF. Seriously?!? When I called to point this out I ended up having to speak to 5 different agents until I finally got a manager who could actually make a judgment call, and rebook all 3 tickets under 1 itinerary on the same flights. It took me 87 minutes (my phone display tells me how long I am on the phone) to deal with United's mistake (unless of course it is their policy to allow a 14 month old to fly by himself??). How much better would it have been if the person I initially reached was empowered to actually fix the situation. And how much cheaper would it have been for United? 87 minutes for something that should have been 10 minutes. So the moral here? Don't skimp on your people. Hire good people with brains and you will see it in the bottom line! Should we start as LLC or S or C corp? Can we compete with our former employer, or hire people away from them? Can I hire all my people as contractors instead of employees? How do I do stock options at the beginning? These are questions a lot of startups asked, answered simply and practically by a top Silicon Valley lawyer in Guy Kawasaki's latest post: Ten Questions with Fred Greguras of Fenwick and West. I highly recommend it. 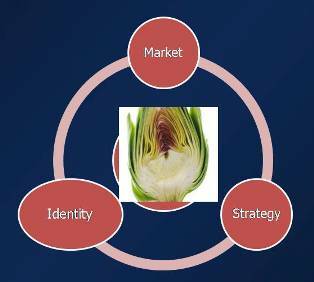 Think of it as the heart of the business, like the heart of the artichoke: it's a group of three core concepts that can't be separated. Market, identity, and focus. Don't pull them apart. It's the interrelationship between them that drives your business. I've been working on this in the context of business planning, particularly the "just enough" planning I've been writing about lately, which I've also called the "not so big" business plan. 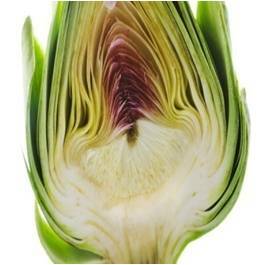 Somebody I know and respect suggested that the heart of a business plan is the marketing plan, and that led me to thinking about the heart of the artichoke. The market is about knowing and understanding your customers. John Jantsch, of Duct Tape Marketing, starts with the profile of the ideal customer. Give your ideal buyer gender, age, family status, economic status, and you can begin to predict what media she reads, what message will reach him, etc. That's true as well for companies and businesses as buyers. I've emphasized what I call "the essential why they buy." For example, famous marketing guru Theodore Leavitt pointed out that people don't buy drills because they want drills; they want holes. Some people choose a restaurant for convenience, some for price, some for special occasions, Some want loud, some want quiet. My company sells business plan software to people who want the planning, not the software. All of this is about understanding the market. You want to know as much as you can about what your potential buyers are like, where they are, what they do, why they want you, and how many of them are there. You have to know your customer and why they buy, you have to understand that in order to build the right messaging, and you have to get the right message to them. You also want a reality check, asking yourself if there are really buyers out there. Will people spend money for what you offer? Where are they spending that money now? Who else offers them competing solutions? 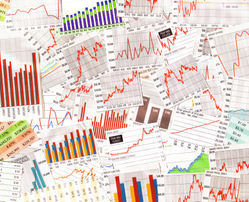 Ideally you want to know your market well enough to do some numbers and forecasts. This is particularly important for a new business, and even more so when you need to convince investors or bankers to believe in your business. For the small startup, you may not have to demonstrate market to outsiders, as long as you're sure of it yourself and prepared to bet your startup on it, that's enough. Another of the three is about you, your business, what I call your identity. How are you different from others? What are your strengths and weaknesses? What is your core competence? What are your goals? Let's think of restaurants again for examples. Some restaurants are particularly good at menus and food quality, some at health items, some live off of a great location. Maybe it's ample parking. Some of the well-known restaurants on Fisherman's Wharf in San Francisco survive on reputation more than anything else. What are the strengths of an airport restaurant? More important, what are your company's strengths? What do you do really well? Part of your identity is what you want from your business. Some businesses are about your lifestyle, or pursuing your passion. Some people want their businesses to grow as big and as fast as they can and are very happy to work with investors as owners. Other folks want to own their own business, even if it has to grow slower for lack of working capital. What's your case? If you're committed to a second income in a home office, incorporate that into your identity. Don't look for generalized formulae, let your business be unique and individual. You can't do everything. In restaurants, you can't credibly offer great food at bargain prices with great atmosphere. If you say you do, nobody believes you anyhow. So you have to focus. Make this focus intertwine and mesh with your choice of key target customer and your own business identity. All three concepts have to work together. Seth Godin's book The Dip is about being the best at one thing. That's the point of your focus. Since you can't do everything and if you ever could, your customers wouldn't believe you anyhow, then you need to focus on something that you do well, that people want. Be the cheap and practical bars of soap that sell in volume in the big chain stores, or be a finely packaged and expensive and sweet-smelling soap that sells in boutiques. Don't try to be both. Understand the principal of displacement: whatever you do in a business rules out something else that you don't do. You can't succeed trying to do everything, so you have to focus. Bill Cosby once said: "I don't know the secret to success, but I do know that the secret to failure is trying to please everybody." These three things are the heart of your business. Don't pull them apart. Don't take them one at a time. Don't ever stop thinking about them. Remember, in planning as well as in all of business, things change. Keep watching. As you think about starting a business, and then begin to figure out how to fund it, be aware that there are some new innovative ways to fund your business. If you are interested in formalizing a friend or family loan, check out Circle Lending. They help you put together a small business loan with money from your friends and family, with payment terms, interest rates and payment coupons. It is a better way of getting money from people you know.